This bold abode expertly mixes a variety of prints, textures and styles—see more photos of this home project by Design Intervention, the Best Bespoke Project awardee for A Celebration Of Design by Singapore Tatler Homes. Vibrant and vivacious like the Eurasian designer Andrea Savage, her maisonette apartment is a reflection of Savage’s diverse cultural background. 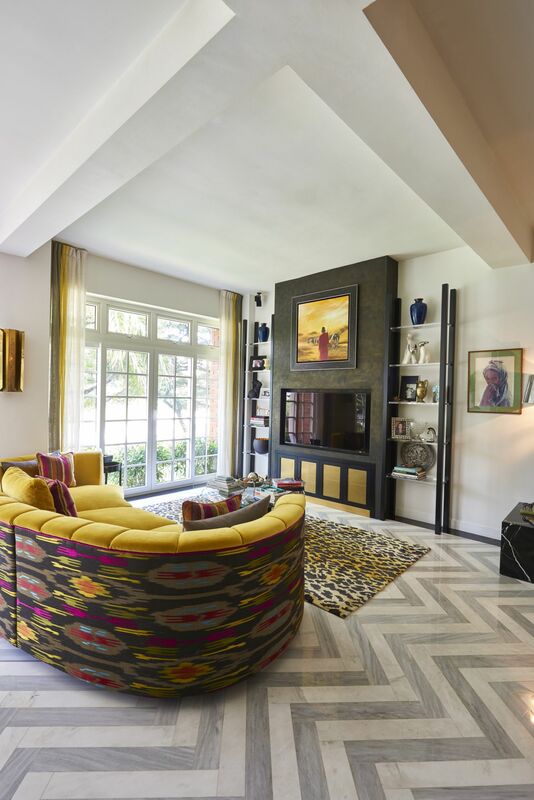 The former model brings a mix of history, textures and colours into a setting that is both stylishly eclectic and graceful. The home of Design Intervention’s partner and design director, it’s one of the most popular features in the February 2016 issue — it’s also our Best Bespoke Project awardee for A Celebration Of Design, the first signature event of Singapore Tatler Homes. To be held on February 28 at Foo'd by David Oldani, The dinner event will commemorate the achievements of top talents in the local design scene. Concealed in a stately colonial structure in Mount Faber, the interiors of Savage’s family home are a surprisingly upbeat contrast to the building’s restrained exterior. Here, vibrant pops of colour, quirky furnishings, items old and new, the flamboyant and the understated are wonderfully mixed into the concept. Savage’s creative flair is present throughout, with a sense of symmetry and restraint guiding bold pieces to create a comfortable and welcoming atmosphere. Here are the ways that you can bring Savage’s canny knack for prints into your home. Within this vivacious composition is an underlying symmetry. “Symmetry makes me feel psychologically balanced and comfortable,” Savage reveals. So it is interesting to discover the symmetries within each space in her home, such as how the coffee table is aligned with the window frame. The prints that Savage has used may be varied, but these do follow a consistent theme — most of these are predominantly black-and-white, especially on the second-storey. Herringbone tiles and other monochromatic prints can be found throughout the home, on the flooring, walls as well as some unexpected places such as the ceiling of a bathroom. When combining contrasting elements, it is important to know when to stop. “Step back and ask, is it finished? Be selective and most importantly, understand yourself as a designer,” she cautions. Savage’s master bedroom for instance, is a picture of serenity, with a palette that comprises of black, white and neutral pastels to create a calming effect. “My home is my sanctuary and provides a peaceful oasis where I can rest my soul. I need a calm room to relax at the end of the day,” Savage explains. “I wanted the apartment to be a vibrant space with pops of colour yet appear uncluttered to the eye. Therefore attention to detail is quite important throughout the whole interior, with specific areas providing visual relief,” she emphasises. In the bathroom, the wall covering may be a riot of colours but the dark background balances the overall effect and mitigates the transition from the wall to the floor, which sports a daring herringbone pattern.